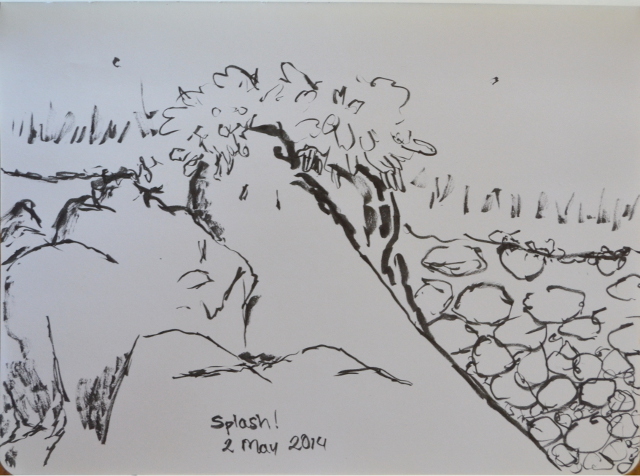 There have been quite a few efforts at outdoor sketches this month. At least in the latter half of the month. 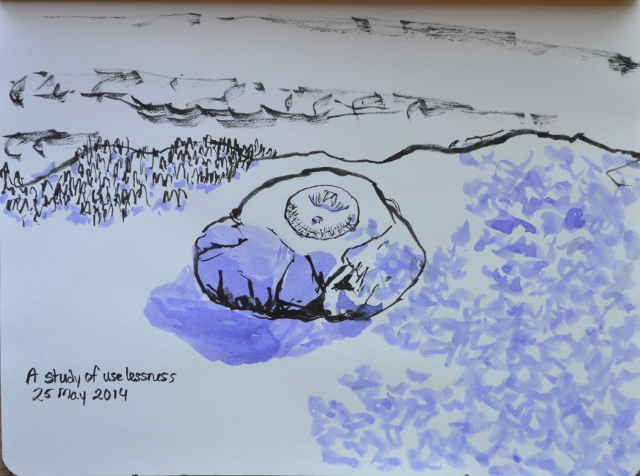 Trying to beat the heat, but it is still hot sitting on this rock by the ocean. 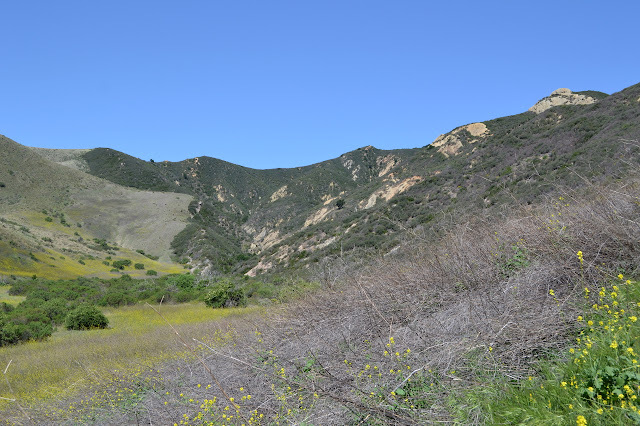 While hiking the northernmost bit of trail on the west side of Gaviota State Park. 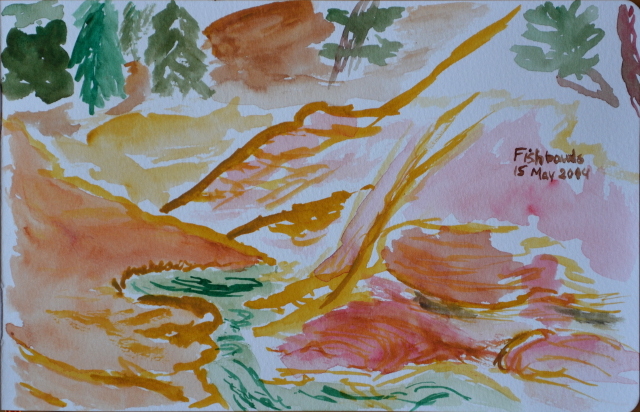 A little lunch painting while on the Sespe River Trail. Taking in the shallow Fishbowls. 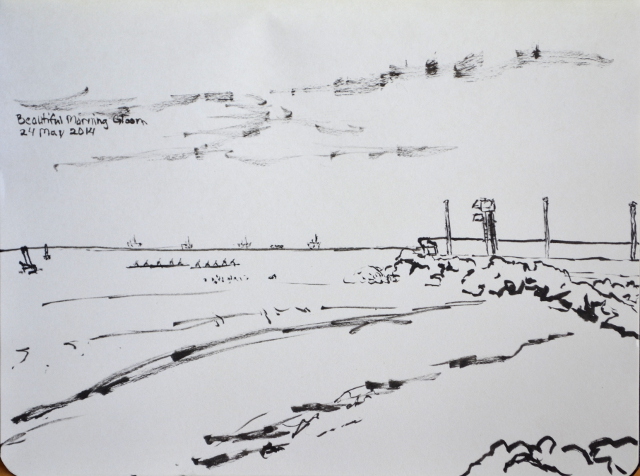 Another bit of sketching by the sea, this time at the harbor breakwater. A sundial with no dial and a bit of nearby tree in the park. By the ocean. Below Tar Pits Park just because. There again a few days later. Up on the bluffs of Tar Pits Park. Hiked to Toro Ridge and looked down on Carpinteria. At Lookout Park before going to Rincon. Sometimes it is just a good day to have a walk along the bluffs and the beach. "The Rincon" is a legendary place where the highway runs close enough to the ocean to get splash during rough seas and an extraordinary number of people have breakdowns and simply must park by the side for a while. It is hard to find a time when there are no surfers bobbing in the water. Get off the freeway at Bates for a bit more legal access, with a bit of Carpinteria State Beach and Rincon Beach Park on either side of the gated community at Rincon Point. Both have free parking and pit toilets, but the county park has a lot more of it. It also has the trail I want to check out, an old road that extends from the end of the parking lot. 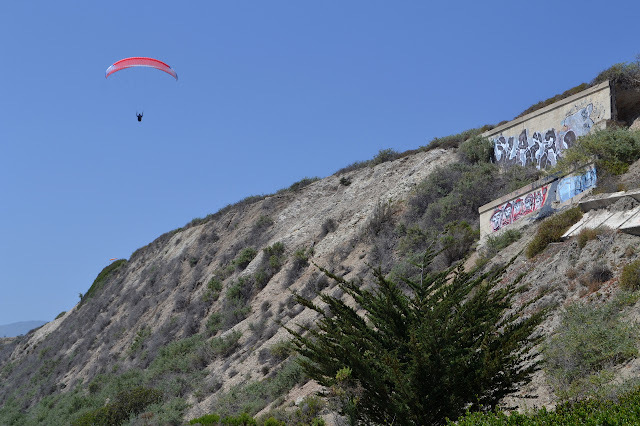 As I start, there is only one paraglider drifting low over the freeway and train tracks. I often see them here, generally in groups. A paraglider hangs just about 100 feet directly above the train tracks without a care in the world. An old wall to stabilize the cliff has become an art installation. I tried Toro Canyon Park a while ago and was disappointed with the hiking possibilities there. This was unfair because I had not exhausted the hiking possibilities, only the one that is easiest to find. Besides the small loop at the main portion of the park, I had learned about a second trail that leaves from the road somewhere. I spotted a likely trailhead on the way out, so it seemed that a trip back for that second trail would not be met with failure at the start. 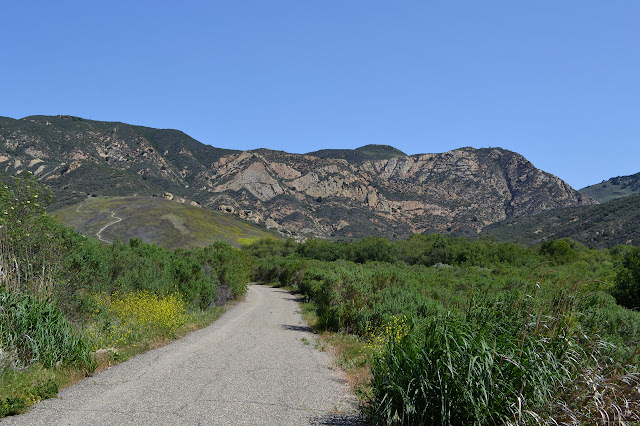 Driving along Toro Canyon Park Road, the start of the trail is easy to spot and signed by the Montecito Trails Foundation. There is a turnout for parking, but it is unclear if the apparently abandoned piece of road that accesses some fenced in equipment needs to be kept clear. There are no signs to dissuade anyone from parking along it and the rest of the parking is not very good, but I leave it open and block the sign instead. 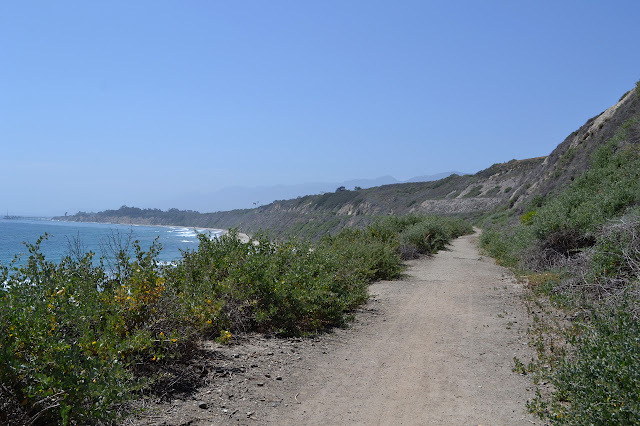 The hints I can find are that this is not a very long trail and I pay little attention to my water, which is only 3/4L and has been depleted while wandering the Carpinteria Bluffs and Rincon Beach, as I head out. 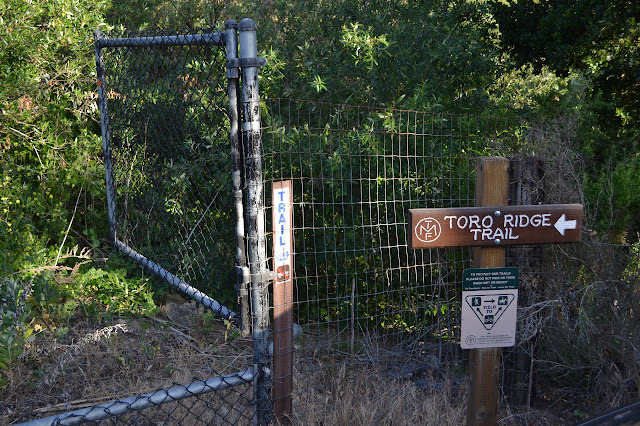 Sign at the start of Toro Ridge Trail. (Day 4 of 4.) The night at Fishbowls was warmer than at Halfmoon. It was somehow the most comfortable night for me and easy to get up in the morning, not that this day promises to be a challenge. 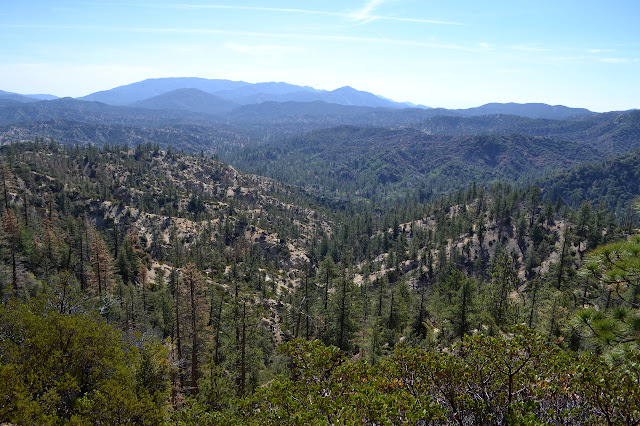 From here, the trail climbs 400 feet up to Cedar Creek and then we climb about 600 feet to get out of the Piru drainage and into Piedra Blanca. We only follow the water a short way before leaving it for a dry fold of land and the rest is dry until after the ridge. We climb through a rugged, but short, land until the junction, where the sign has never been planted. 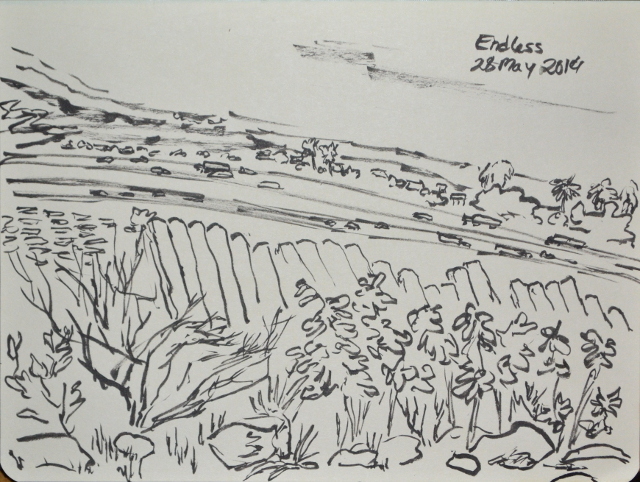 The lookout can just be made out, still standing, on the distant Thorn Point. 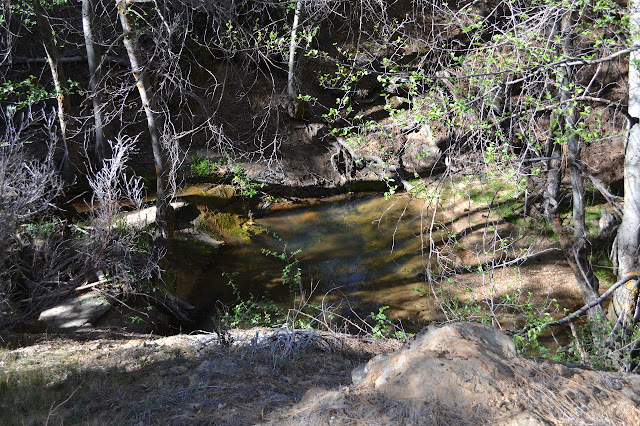 Following this tributary up from Piru a short way, there is one last pool. 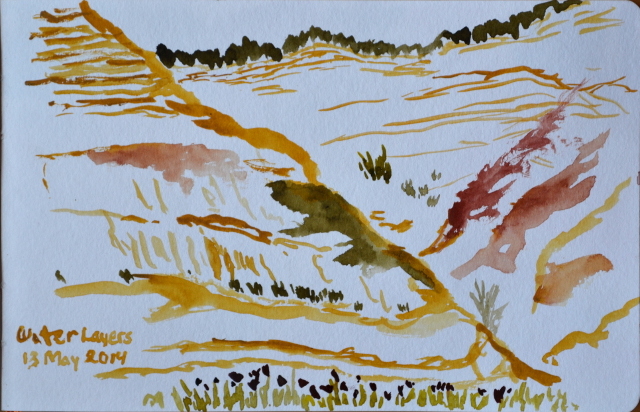 The yellow cliffs that were in the background are now nearby. High enough to see back into the Grade Valley area. (Day 3 of 4.) The night was a bit on the cold side, which is to say I was quite comfortable under my too warm quilt. The vapor on the exposed side of the Platypus on the ground even tried to freeze, although the one on top of it showed no signs of frost. We are slow to get started as the hardest days have already past and this one should be the easiest. With the flow in Piru looking so low, we will keep a sharp eye on it. After two years of very low rainfall, you have to keep close tabs on the water and always know where the last was. There are interesting water features planned for the end of the day, but first we have to do a lot of road walking. There are still a few flowers by the side of the road. Walking towards Grade Valley on Grade Valley Road. The valley is wide and flat, but the distant landscape looks steep. Some shaped mud in the creek bed. The water is flowing at the far side of this. (Day 2 of 4.) Grabbing a little water to warm up my unfinished supper (it was so late my appetite had vanished), I cannot help but notice that while it is not warm, it is warmer than I expect. The leftovers go quickly now and we pack up to have breakfast at Sespe Camp where there is a table and even a toilet with walls. 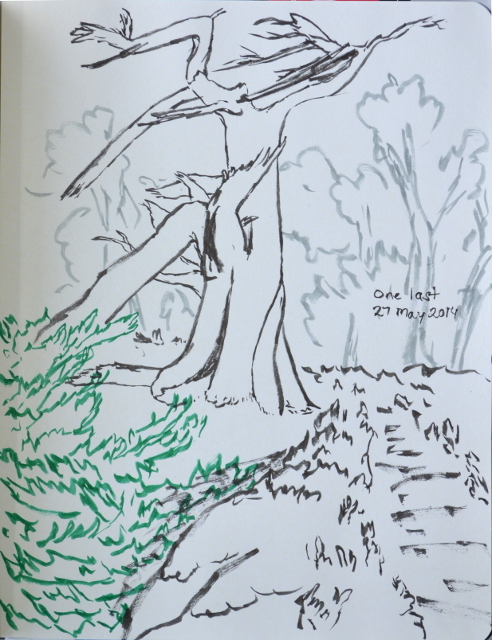 It is close enough to the trail that we may have found it in the moonlight, but it is hard to be sure and the Harrison map incorrectly places it is after the stream crossing. The water seems just a little warmer here as I get enough for cooking and the morning hiking. Just after camp, the trail does cross the stream and become elusive. There is lots of clear space to walk heading upstream, but little indication of anyone doing so. There is a small path through some vegetation, but it is a bit low for such a well used trail. From the perspective of the other side of the stream, there is another break in the vegetation a little downstream where the trail does go. With the map saying the camp is further on and the trail briefly hard to find, this could have been intensely stressful in the moonlight. In the sun, it is a brief head scratcher before clambering up the bank on the other side past an old metal sign with no apparent purpose. In no time, we are at a junction and a rather well used camp. The rather well used camp which includes a grill, but mostly this pool built just below the trail. The junction is sooner than I expect, but consulting the map shows that is just a memory problem. 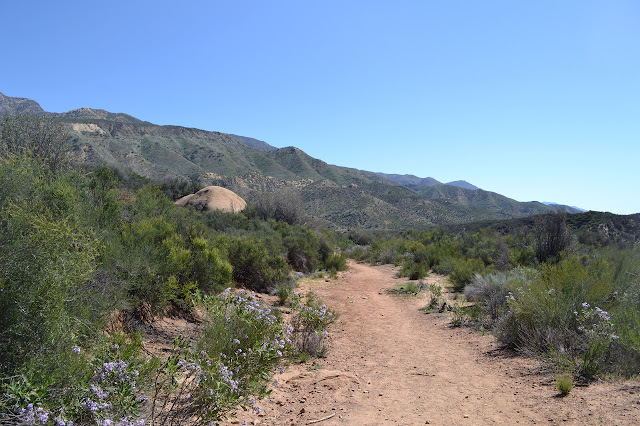 The trail up to Sespe Hot Springs is wide and flat. The canyon walls rise steeply on either side. There are a number of camps along the way and a few clumps of palm trees. Some of the trees are doing very poorly. Water is pouring out of the canyon wall to the east. 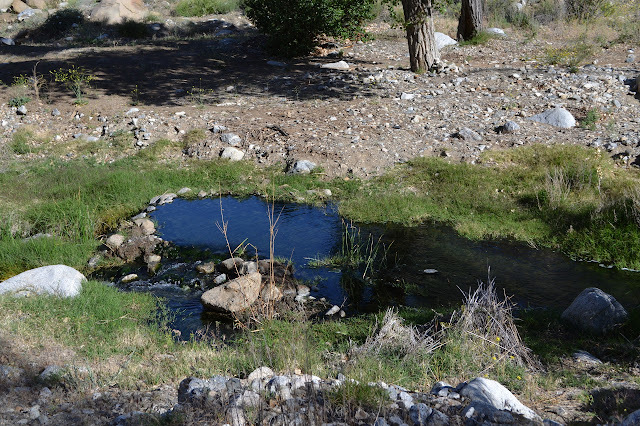 I had been told once that Sespe Hot Springs is a mud hole, which I think was an attempt to illustrate that it has no amenities (specifically, a tub) like Willett. I have also been told by someone that he experimentally determined they are hot enough to cook dinner. What I see around me is most decidedly not a mud hole. As the trail crosses the creek, I stick a finger in it but retreat quickly. It is red, but not burned. I can believe you do not need to bring a stove to cook dinner here. 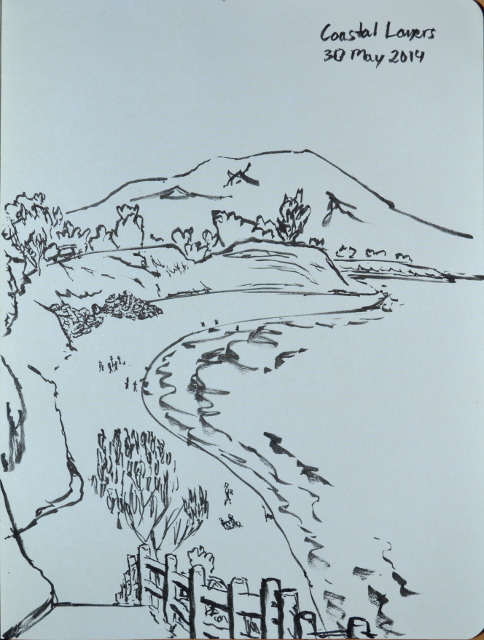 The direction of the path on the far side is no longer apparent, so we start to wander. Following the trail, really still old road, into Hot Springs Canyon. 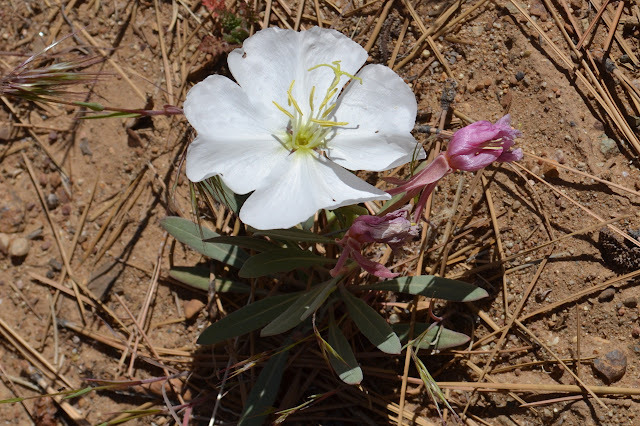 It is populated with palm trees and cactus and algae in various colors and evidence of big horn sheep. 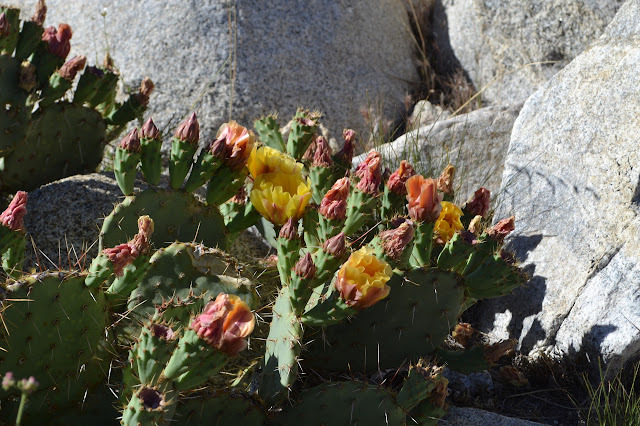 The prickly pear are starting to bloom. (Day 1 of 4.) 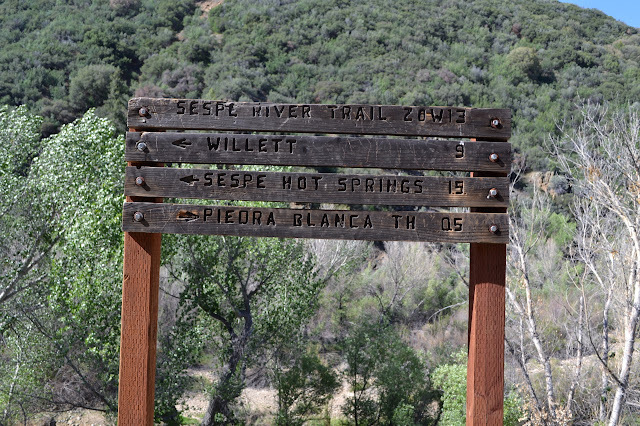 I have been wanting to see what the fuss is about concerning Willett and Sespe Hot Springs and the Fishbowls. 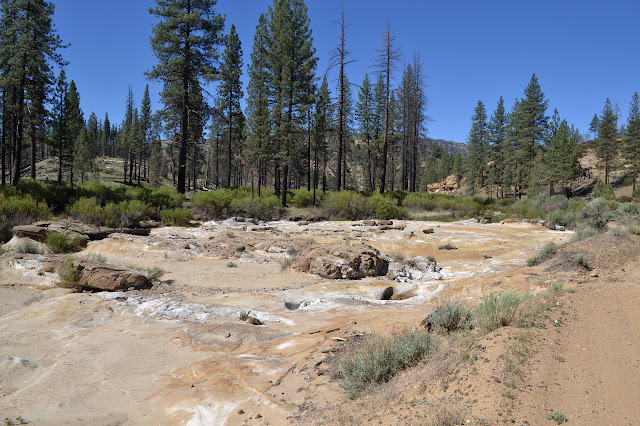 The hot springs seem to need at least an overnight while the cold water feature can be done in what appears to be a nice loop day hike when the road is open. It is currently closed due to storm damage. 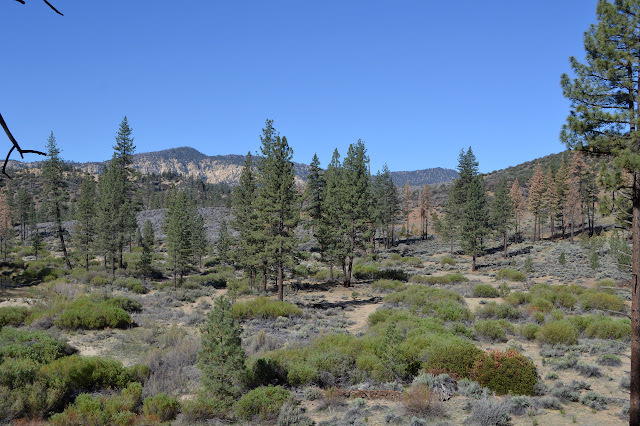 A recent article in the local Sierra Club chapter's newsletter, the Condor Call, points out these two desires can be combined into what is one of the authors' (local guide book author Craig Carey and local cartographer Bryan Conant) favorite backpacking circuits. It is billed as a 40 mile loop that is excellent for five days out. I figure I like my days a little over 10 miles, so if it is cut a little differently, it should be a nice four day. The summer heat is starting to take hold, so actually staying at hot springs is seeming less interesting than just seeing them. I estimated the loop to actually be more like 46 miles after getting out the map, but still reasonable in four days. The second day is just 6.6 miles, so it got divided up into the first and new second day. It front loads the trip a little, but the day hike yesterday should help as a shakedown. Camping after helped too, showing my uninsulated inflatable mat has already developed a slow leak somewhere, leaving me to haul out the basic blue that lives in the car. Very disappointing. 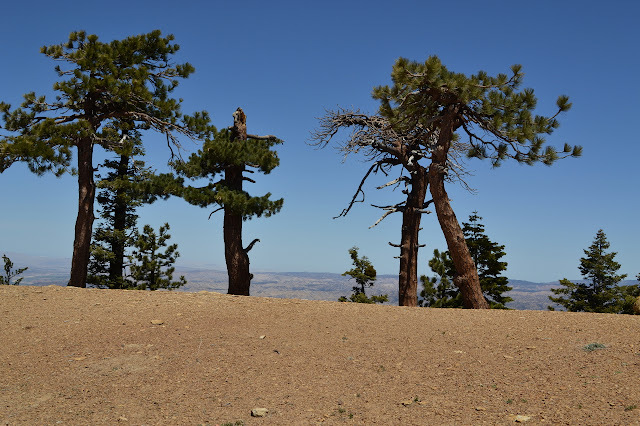 (On camps, Reyes Peak and Pine Mountain had a few people Monday morning, but were empty by the evening. Middle Lion was nearly full Monday evening.) There are only two cars at the trailhead as we start. There are more choices, but these are the ones that the sign maker saw fit to put on the sign. 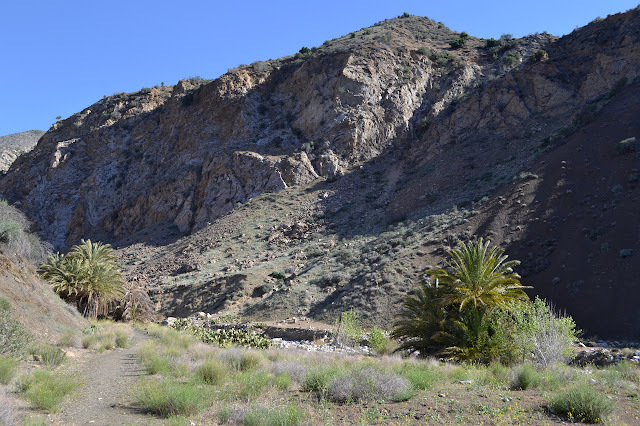 The trail starts off crossing the nice flow of Lion Creek, then wanders downstream to cross the Sespe River in two parts before clambering up to meet the old road that is now the trail. The trail is, at first, just a smooth and wide drift looking down on the river. Much of the time, the water cannot be seen, but trees mark its location in the wide valley bottom. When it can be seen, there are large pools with big, smooth rocks that look incredibly attractive for hours of lounging and swimming. At least a few of the old road survey markers still exist. They do not interest me as much as the more interestingly named benchmarks, but I have been known to go after one or two before. One might think we are on easy street. 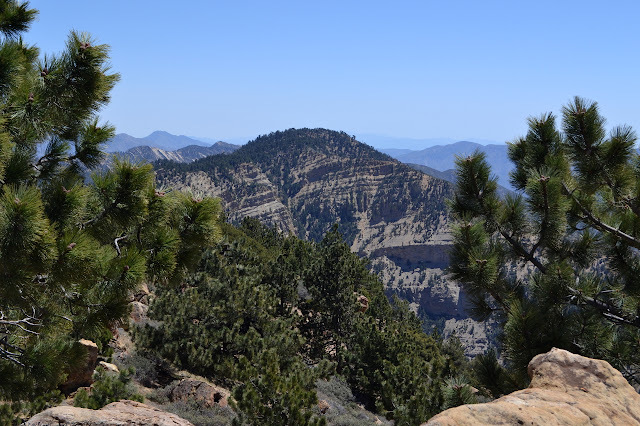 The road is open and the peak is easy again, so maybe it is time to wander along the ridge up to Reyes Peak, then down the back and up to Haddock Peak again. It has been annoying me that I have not yet found the benchmark labeled HADDOCK. 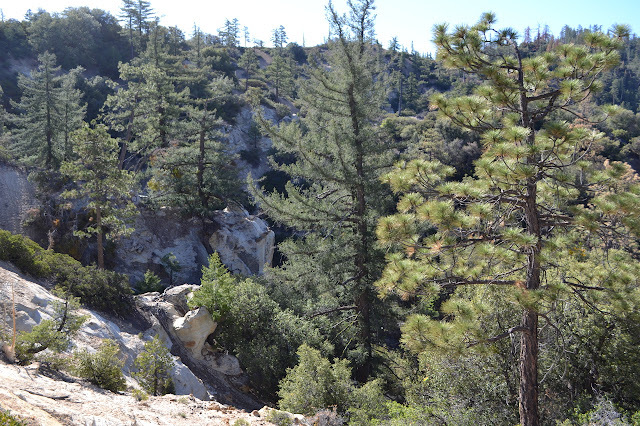 There is one shown on the Lion Canyon quad in the far upper left corner, somewhat off the trail as it comes down the east side of the mountain. I checked the NGS database before coming, but it does not seem to be represented there. I am getting suspicious that it is the ones without reference marks that have been left out, which will make this one harder to find as there is only one chance instead of two or three. 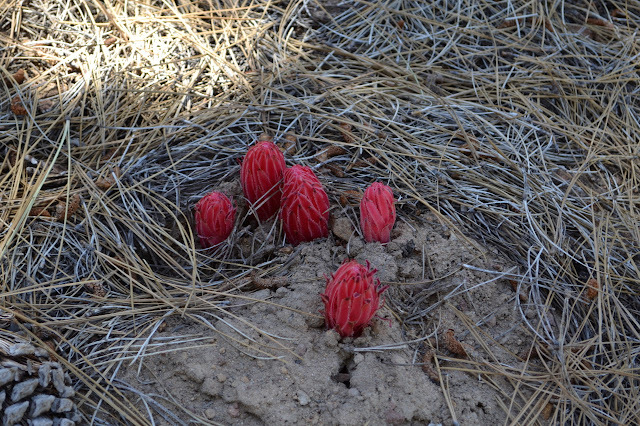 The snow plants on the way up are always surprising as they come up in big clumps or singles as large as the larger Jefferey's cones. Clumps of snow flowers provide many spots of red along the side of the trail and always seem to have a few more clumps a few yards off. Once at the peak, Haddock is an impressive cliff far down the ridge. Basking in the sun and the view while having a nibble, then it is time to check on the old ice can stove and head down the other side. The register has been moved, so I put it back in its regular spot after signing. It still says "this side down" on the bottom, but I am not sure it is still my writing. The stove still sits beneath a tree looking south. The trail may be getting a bit better. I follow the ridge, but there seem to be lower ones taking a somewhat easier route to the north of it. Haddock Peak, the goal for today, is not too far away. I have not had a useless search for boundary posts that are likely not there, or might not even be recognizable to me as boundary posts if they are there, in a while. 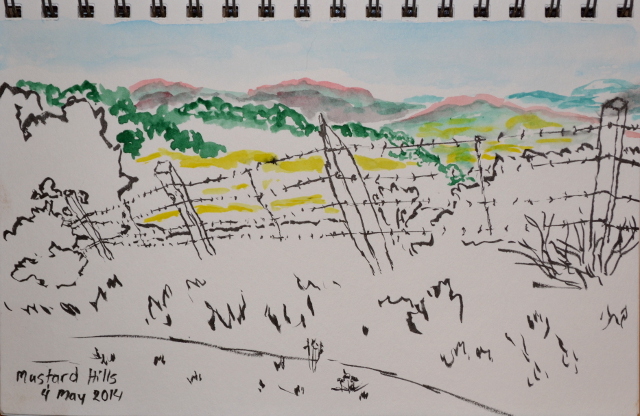 There are a couple up on the ridge marked on the far west of Gaviota State Park that I have been eyeing. I thought I might have a look for them while taking in the loop on the west side of the park on a sunny day, check out the spurs along the way, try out some further ridge route stopping by a hilltop benchmark (that may or may not be there), drop off a geocoin, and check for other geocaches along the way. The whole nine yards. There are three possible trailheads for this. I select the one that requires the least gas and make the left turn into the campground by the beach, but take a right at the fork to the free trailhead parking. There is a lot of traffic coming from Hollister Ranch and a few groups on the trail up to the wind caves. Head out along the pavement. It is only about half a mile before getting to proper trail, seen twisting up the hill ahead. 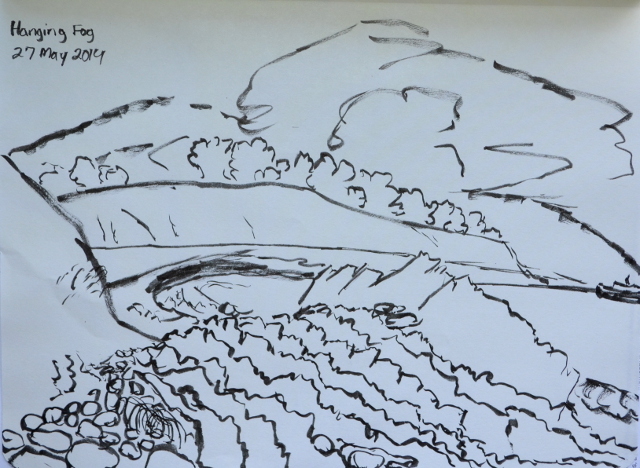 Looking along the hills shows a sudden change in vegetation due to the rocks below.